1. Epoxy Protects Against Lifting and Peeling. Regular floor paint can peel and lift. Over time, these patches become unsightly and even dangerous. 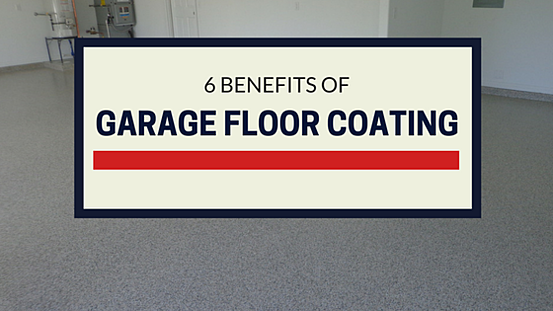 With epoxy, the hardened coating is bonded to the floor in your garage, meaning that it will stay down. Our process starts with commercial grade grinding to remove any old coatings and open up the floor so that the epoxy can penetrate deeply. Then, the coating is applied and left to cure. This process gives you durability for years. Over time, the cost per year of an epoxy floor drops to impressively low amounts. And, should you decide to sell, your epoxy flooring can be a big bonus and a strong attraction for potential buyers. 2. Garage Floor Coating Is Impact Resistant. No need to worry about dropped tools marring your floor. Epoxy cures to a hard and thick finish. This makes it resistant to impacts, as well as chemicals and surface abrasion. So, you can drag a tool box across without worrying about leaving marks. No need to worry about damage if you accidentally spill chemicals, as well. Even if you are tough on your floor, you can expect years of great looks and hard wear. 3. Garage Floor Coating Makes Your Garage Look Good. With a nice epoxy coating, your garage can be a show room. There are a number of colors and textures to choose from to fit every taste. Pick decorative chip finishes with the look of granite, slat or another surface. Or, you can choose from a range of solids, with every shade from neutral sand beige to arresting blue, green or yellow. The fresh look makes the entire area look put together and pleasant. Have a corner that would make a great man cave? Want a workshop that will make all your friends jealous? A fresh epoxy floor is a great place to start. The surface elevates any room, allowing you to enjoy more livable and useable space in the home you currently own. 4. The Coating Covers Cracks and Flaws in the Concrete. You can fill and repair cracks and flaws in a garage floor. However, with many methods, they'll just come back again, worse than ever. Paint might fill the area in, but it will never truly seal it and permanently fix the crack. An epoxy coating is thick and solid enough to completely fill and eliminate them. Our skilled technicians can properly prep your floor before applying coating so that all cracks and flaws are handled. A polymer filler is used to fill cracks and pits while any bumps can be smoothed with a diamond tooling device. Our crew can deal with chipped areas and other flaws to create a smooth and durable surface. Once the flooring is completely installed and set, it will look like they were never there. 5. It's Easy to Clean. The garage is the room that seems to take the most abuse. Dirt and grime from tires gets tracked in. Kids run through with snow and mud on their feet. Since the garage is also usually the family workshop, oil, paint and chemicals can easily spill on the floor. With bare cement and other coatings, you can wind up dealing with a real mess. In some cases, stains set in permanently no matter how quickly you get it all cleaned up. Epoxy floors are different. 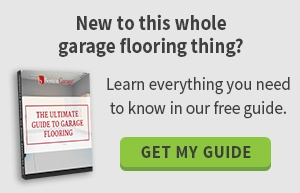 No more struggling with stubborn garage floor stains. When you have epoxy, oil, grime and other materials lift up quickly and easily. Epoxy floors are resistant to moisture, dust, dirt and grime. Unlike bare cement, wetness and spills do not penetrate, causing stains. Most of the time, you'll be able to simply spray your garage floor clean with a spray nozzle on your garden hose. When there is serious dirt and grime on the floor, simply sweep, then fill a bucket with hot water and four to five ounces of clear ammonia. Any dirt, oil or other materials on the floor will come off quickly and easily, leaving your garage floor looking fresh and clean. 6. It Improves the Safety of Your Garage. Slip and fall accidents in the home are a major cause of injuries. They're the most common source of injuries in the home and second only to car accidents for individual deaths. When your garage floor gets wet from snow, rain or spills, many coatings can leave the area slippery and dangerous. It's easy to go skidding across the floor, especially when you are carrying groceries into the house or engaged in another task. Kids tend to run when heading in and out, making it more likely that they will slip on a wet surface. 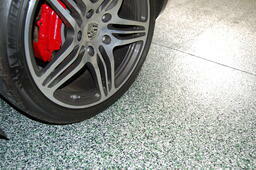 When having your epoxy garage floor installed, consider asking for a non-slip finish. These additives can be used in your floor to ensure that it resists slips, even when water makes its way into your garage. Is it time to give your garage a fresh new look and more functionality? Epoxy coating can update the room and give it new aesthetic appeal. Our skilled technicians bring years of training to the job. A complete installation takes just two days. Before you know it, you'll be enjoying your newly spruced up space. Want to learn more? Contact us now to discuss garage floor epoxy coating options.